The MCA-Omaha staff and our Leadership Academy students would like to celebrate all of the exceptional administrative professionals out there by delivering a small “thank you” on Wednesday, April 24th. 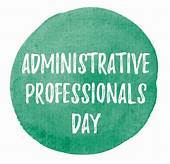 Please let us know who in your office you consider an administrative professional by April 10th. • Please note, this event is only open to MCA-Omaha MEMBER companies. Contact Michele at 402.592.3330 with any questions. Registration is now closed for this event. Please contact Michele at 402.592.3330 for additional information.